Located in the densely populated city Tbilisi, the non-profit Tbilisi State Medical University was founded in the year 1930. It is a university offering higher education not only to the students residing in the country but it also has reserved seats for international students coming from the different countries to pursue MBBS in Georgia along with the study in the different areas of medicine. Tbilisi State Medical University (TSMU) is a recognized by the National Center for Educational Quality Enhancement engaged in offering quality and higher education. The university offers programs and courses leading to higher educational degrees including bachelor degrees, master degrees, and doctorate degrees in the various field of specialization. 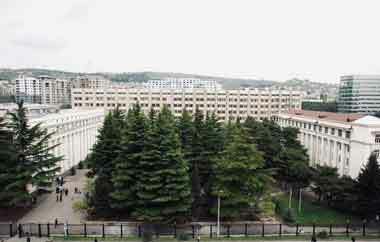 Tbilisi State Medical University (TSMU) is an 88 years old institution offering higher education. The admission to the different courses in the university is based on a selective entrance examination process. It has over 70% admission rate range and has become one of the most preferred universities for MBBS in Georgia for Indian students categorized in the different reserved categories. What Documents are Required for MBBS Admission in Tbilisi State Medical University (TSMU)? Students from India have the option to select from the multiple medical universities including Tbilisi State Medical University for MBBS in Georgia at a very low fee.